MONTH 20 – Almost TWO Years of Pain and Suffering and More! Yes, it’s been almost 2 years of pain and suffering. I only had a really good break (there had also been some short ones in between) between September and mid December of 2014. I ended up flaring horribly again around December 19th or 20th. Not sure EXACTLY which day now. As I sit here and type though I am suffering quite a lot. The oozing started again and every single initial symptom is back except for the nerve pain. I don’t know what or if anything triggered it but I am feeling pretty dog on miserable. To top it all off, it’s taking it’s toll on some of my loved ones. The thing that is really holding me together is my faith. In fact, I am back to serving Jehovah again! There was a time where I had lost faith (a long time) and had left. I didn’t even call myself a Witness. There are times in life though where you have to take a step back and really look at your life and ask yourself, “Is this the life I want to lead?” and “Am I really truly happy?” The answer to both of those questions was, “NO” because I was actually happier serving our Creator. I finally saw how important it was for me to draw close to him again! I know that even though things are bad now for me physically, things will get better for me in the future. How do I cope? Daily prayer. I mean I talk to him like I talk to a dear friend and I ask for healing through his Son Jesus Christ. Prayer has helped me immensely! I may look horrible but my prayers I feel are working because I AM healing, I AM feeling pretty dog on good (although still experiencing pain and suffering) and this condition has NOT made me go crazy! Last night I was a mess though with the oozing all over. 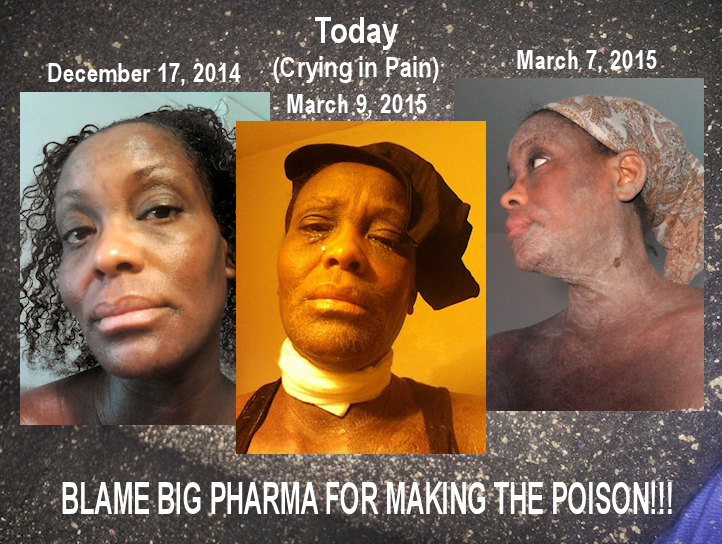 I was all sticky, my arms, hands, neck, upper chest….I felt disgusting and looked even worse. When I awoke in the morning I could barely get out of bed let alone help my child get ready for school. My situation wasn’t understood and I was treated poorly, but you know what? SO WHAT! If I cannot do something I AM NOT GOING TO DO IT. It’s funny how people always want me to do for them but just can’t seem to help me out as much as I need the help. It’s cool though because once I am better, they are going to see a whole different person. Then I won’t be such a burden. I just threw these recent pictures together for you to view. I realize that many of my readers want to see more of what I am suffering through. Here you go! More PROOF! And there you go! This is REAL folks! Now let me go back to bed. Previous Post A Breakthrough – Feeling Normal Again! I’m so sorry for what you’re going as I to am going through TSW. I’m approaching my one year mark in a few weeks and it’s still so difficult to deal with. The question I have for you is does the incessant itch ever calm down or dare I say stop? Also, do you take any kind of medications for the itch and pain and if so which ones? You are a such a positive person and I always look forward to watch your videos. Please continue to make them. We are healing and we will be healed. Thank you for commenting! The incessant itch comes and goes and it doesn’t last as long as it did in the earlier stages thank goodness. Unfortunately though, I have been waking up with “itch attacks” at night, but still, not as bad as before.